After seeing Toy Story [Will Gorman’s] son wanted to play the Crane Game. 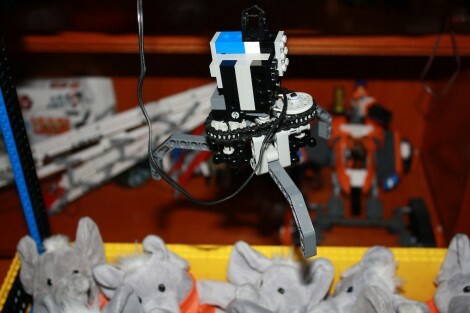 Rather than hanging out in the lobby of the pizza parlor, [Will] built one at home using Lego. The skill crane as he calls it has a large gantry to travel over the top of the treasure box. The claw can move side to side on the gantry, dropping for a chance at some loot once it’s in the right place. See a successful run in the video after the break and if you can’t help yourself, there’s build instructions that will have you up and running in no time. But you don’t have to build it out of Lego, sometimes you just need some junk to pull one of these together. ooooh, he has been chosen….. This will save me THOUSANDS in quarters! The claw should automatically move to the prize box and release after the pickup sequence. Other than that, awesome job. In commercial claw games, you can set the pressure used on the hook to make the game more difficult or more easy for the user. Wouldn’t be a bad idea for this to be added so the kid can get some practice. That’s cool. I really want to mill an aluminum frame and build the real deal though. I already have a couple of coin validators, just need to put something shiny in there…. That kid has a lot of self control not to just reach in there and move the things around to get a better grip. Like a previous poster said, the only thing missing here is having it return to the start position and open the claw after it grabs something. Though I can see how that would be difficult with the current build, as I don’t see any way for the software to see the coordinates of the claw or determine when/if it is hitting the limits of travel. YES! Indoctrinate the children. There is little time left. The government should give out Legos at birth. Death to the MBA’s !!!!! !